pdf viewer and watsapp supportable ????? Hamzat, 09 May 2012Hello, can somebody tell how good is NOKIA ASHA 302?can' t access to youtube. what should i do? Its a decent phone value for money lacks secondary camera so video calling, its not a smart fone but the phone has wifi connectivty is good its a S40 series phone design is good value for money. Hamzat, 09 May 2012Hello, can somebody tell how good is NOKIA ASHA 302? The "Premium Messaging" section is full with bullsh...t. The push email service it's not working correct, no support for exchange, ... The phone right now is a BIG disappointment, at least for me. Yes ! Application which makes NOKIA ASHA 302 from normal phone to smart phone is out in NOKIA Beta Labs for testing ! MAIL for Exchange is great app !Great to know NOKIA kept its word on its release atleaset BETA ! Mazak2022, 08 May 2012can Anybody inform me whether Nokia Asha 302 supports Symbian OS? Can we install MobileVoip /... moreHello, can somebody tell how good is NOKIA ASHA 302? no my friend you are mistaken----nokia just said "smartphone lite" and not smartphone. hi, someone pls heelp. ive just purchased a okia 302 and the screen is sooooo bright. i have looked on google for nokia asha 302 screen filters and various other mixes of the search and come up with nothing. i really dont want to send the phone back but where would i get a filter? ive only looked at the phone for 5 mins and got eye pain!! hey...is this phne has a loud sound....????????????? can Anybody inform me whether Nokia Asha 302 supports Symbian OS? Can we install MobileVoip / Skype etc? Mayu, 05 May 2012guy's, buying this phone is waste of money coz this phone does not have OS... It's price in In... morealso had a galaxy y for a month then i sold it coz i couldnt get over the ugly ui, poor camera and very poor screen quility. now i'm very happy with my nokia 303, which is an absolute joy to use. simple but fantastic. The problem with the battery of the Asha 302 is caused by Whatsapp because the app is always on, working on background. Many people are complaining about that across the internet, So, it isn't a problem of the phone or the battery. 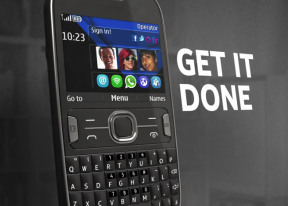 Those who own a Nokia Asha 302 and 303, the wait is over! Mail for Exchange Beta is now available at Nokia Betalabs! Im trying it out right now, so far so good! gi2, 08 May 2012Hi guys. please tell me is this phone support sms(Threaded view) feature weather Nokia ASHA 30... moreyes! Total of 3523 user reviews and opinions for Nokia Asha 302.